Adam Greene is a 10-year old boy who's father works with the government on developing ecological inventions to help the environment. One day Adam's father gets a phone call from the director of Ecology Emergency Network with a new assignment: the reef off the coast of St. Julien in the Caribbean is rapidly dying and they want Adam's father to track down the problem before it is too late. Adam, an experienced diver who follows into his father's footsteps, joins him, and plunges into an incredible underwater adventure. With his new friend, Delphineus the dolphin, Adam discovers the underwater city of Eluria where various sort of sea creatures reside. The city is polluted by human garbage and poison, threatened by lack of food and a hungry flesh-eating sea monster. If only their king, Cetus, would be there, but the whale king has been missing. EcoQuest is designed to teach children about the importance of environmental ethics and is a part of Sierra's educational Discovery Series. The game cannot be lost or rendered unwinnable. It uses a fully mouse-driven version of SCI and VGA graphics. 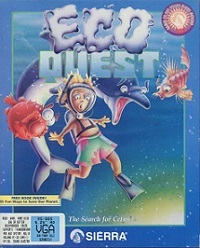 EcoQuest: The Search for Cetus, was first released on floppy disk, then on CD-ROM with full speech. The game introduced the recycling symbol to Sierra's standard palette of command icons, giving the player bonus points for picking up litter. It features a simple form of copy protection in the first scene, which was removed in the later multimedia version. The game, designed by Gano Haine and Jane Jensen had one sequel, EcoQuest 2: The Lost Secret of the Rain forest.